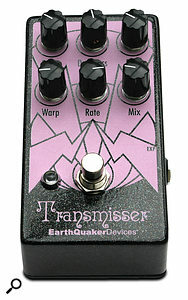 Current digital signal-processing technology now allows pedal manufacturers to create studio-quality reverbs that evoke the spirit of classic springs, plates, concert halls and caverns... but EarthQuaker Devices’ Transmisser takes a somewhat different direction — it’s more likely to evoke the spirit of questionable mushrooms or a hangover in outer space! 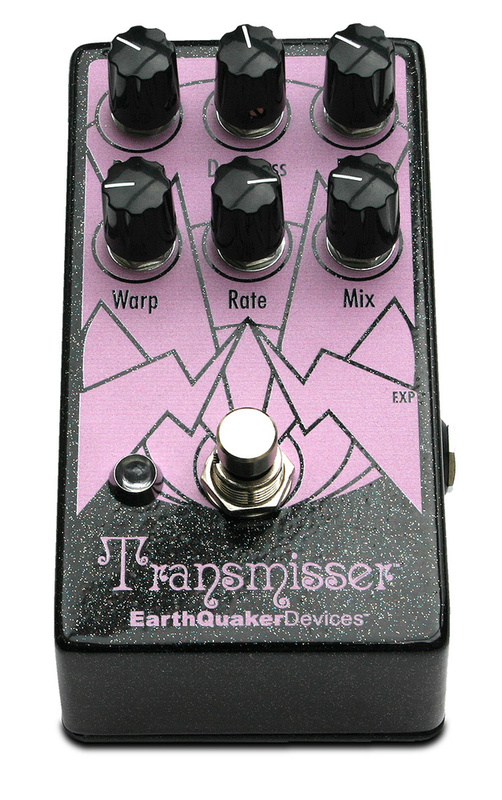 Essentially, the Transmisser generates a very long reverb tail and then feeds that through a resonant filter with some modulation thrown in, and the result is anything but subtle. However, if you are into ambient soundscapes or just sonic damage, Transmisser might be your new best friend. While the processing is unashamedly digital, the dry signal path is all analogue and the pedal has true bypass switching. A Boss-compatible 9V PSU is required, capable of delivering at least 70mA of clean current. Sporting a few more knobs than your average pedal, the controls are arranged into two rows of three. The top row controls Decay, Darkness and Frequency, which together affect the timing and timbre of the reverb. Decay tweaks the length of the reverb tail over a limited range from about 15 to around 20 seconds, and seems more to affect the timbre of the reverb tail than it does the decay time. Darkness shaves some top end off the effected signal. Freq adjusts the resonant low-pass filter frequency, the filter being deliberately peaky in character, and if you feel the need for more control at your feet, you can jack in an expression pedal to control its frequency directly. Moving down a row we encounter Warp, Rate and Mix. Mix is fairly self-explanatory, as it does the usual wet/dry balance thing. Rate adjusts the speed of the overall modulation, while also tying into the modulation depth to keep the effect within a ‘sensible’ range (not that that term has much meaning here!). The Mod section also modulates the Freq and Darkness parameters, over a range determined by the setting of the Warp control. Warp seems to affect nearly everything and the effect of turning it sounds like changing the speed on a tape echo, so it may well be linked to clock frequency. It affects the modulation character, the depth and resonance of the filter and the overall timbre, taking the sound from smooth and chilled to not-so-smooth and not-so-chilled. Something you need to appreciate is that many of the controls are interactive, so the results may not be exactly as you first expect, though making meaningful adjustments soon becomes second nature. Modulation can go from a gentle shimmer through to a noticeably vibrato-like effect, with the slower speeds creating dreamy slurs. Perhaps the nearest comparison is something like the Eventide Black Hole; although the Black Hole has a somewhat wider repertoire, the sense of ‘other worldliness’ is not dissimilar. While the Transmisser works well to add a shifting textural bed of sound that floats underneath a guitar part, it can also inject new life into electric piano or synth sounds and can even do pleasantly weird things to percussion, so don’t be afraid to try it on anything. The only thing it doesn’t do is ‘normal’. If you’re into trippy, hippy sounds, this is definitely for you. If you want an EMT plate emulation you’ll need to look elsewhere!